26 February 2019 – NEINVER, a leading investor, developer and operator in the European outlet centre industry, has announced sales growth across its outlet portfolio in 2018. Total sales reached €971 million, a 3% like-for-like increase compared to the previous year. The company welcomed 42.3 million visitors across the 15 outlet centres in Spain, Italy, France, Germany and Poland. The solid year-end figures for the centres managed by NEINVER were supported by a strong last quarter of the year, and especially Christmas trading. Total occupancy at NEINVER’s outlet portfolio, which comprises around 600 brands and close to 1,400 stores, remained high at 96%. The centres in Germany, where the company operates Halle Leipzig and Montabaur The Style Outlets, led the positive results in both visits and sales, recording double-digit increases in each. Brands’ total sales increased by 14.5%, while footfall rose by 15% to 3.1 million visitors. Growth was led by the excellent results of the Halle Leipzig centre, which increased its offer with the opening in April of Phase II. The centre added 7,000 m² of GLA and 30 stores, introducing brands such as Esprit, Skechers, Triumph, O’Neill, Brax, Sunglass Hut, Odlo, Cecil and Blank Home. In Spain, the six outlet centres in Madrid, Barcelona, A Coruña and Barakaldo recorded an annual sales growth of 3% and received 19.7 million visitors, a 2% like-for-like increase. Viladecans The Style Outlets, which opened in 2016 in Barcelona, led the growth with a double-digit sales increase. In the French market, sales at Roppenheim The Style Outlets rose by 2% and the number of visitors reached 1.8 million. NEINVER is working on renovation of the exterior areas of the centre, including greenery, a children’s playground, and outdoor dining areas, among others. 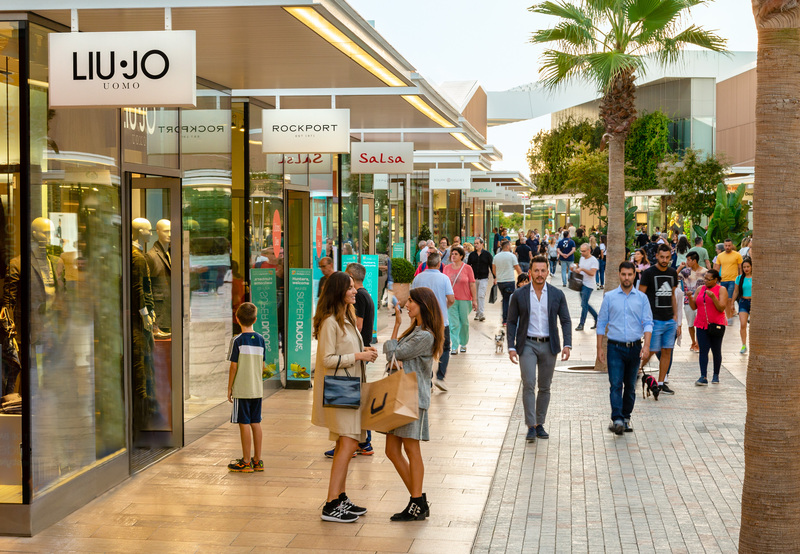 The two well-established The Style Outlets centres in Italy – Vicolungo and Castel Guelfo – increased sales slightly, by 1%, and welcomed 6.3 million visitors. Renovation of Vicolungo The Style Outlets started in 2018. This includes the remodelling of the main square, the canopies and the street furniture, among others. In Poland, the four FACTORY centres in Warsaw, Krakow and Poznan received over 11.3 million visitors and increased sales by 1%, despite the Sunday opening bans introduced in 2018. The company completed refurbishment works in FACTORY Krakow in 2018, including a brand new food court, and is now working on the renovation of FACTORY Poznan with a new interior design, a children’s playground and new relaxation zones. Moreover, NEINVER introduced over 20 new fashion brands to the FACTORY centres. NEINVER’s programme of new development, acquisition and expansion will aim to double the volume of new properties in the pipeline over the next five years, adding about 150,000 m² of GLA in new space. The year 2020 will see the opening of Amsterdam and Alpes The Style Outlets, both nestled in prime tourist locations. Construction is well underway in Amsterdam, NEINVER’s first project in the Netherlands. In France, the company is working on its second French outlet centre, Alpes The Style Outlets, located close to the Swiss border between Geneva and Lyon. NEINVER will also run Silesia Outlet in Gliwice (Poland), which will open in spring 2019, through a partnership with the investment company 6B47.